If you didn’t find that funny I can do nothing for you. Now to the day’s events. I slept great but my dear lady didn’t enjoy the motel lifestyle. Pity because we are in another one right now. It was a bit noisy late and first thing this morning. I can sleep on a rock so it made no difference to me. Breakfast was underwhelming but free with the room so no complaints. A bowl of cereal can’t really go wrong. The rain was pouring down so we had to dig out our coats and pinch ourselves several times to remind ourselves that we were close to the Arizona desert. I guess we brought the Scottish weather with us because there were times on the road when you could have been on the road to the Western Isles. The landscape was similar, if you ignored the red colour of the earth, and the rising mountains even had snow on them as we moved further west. 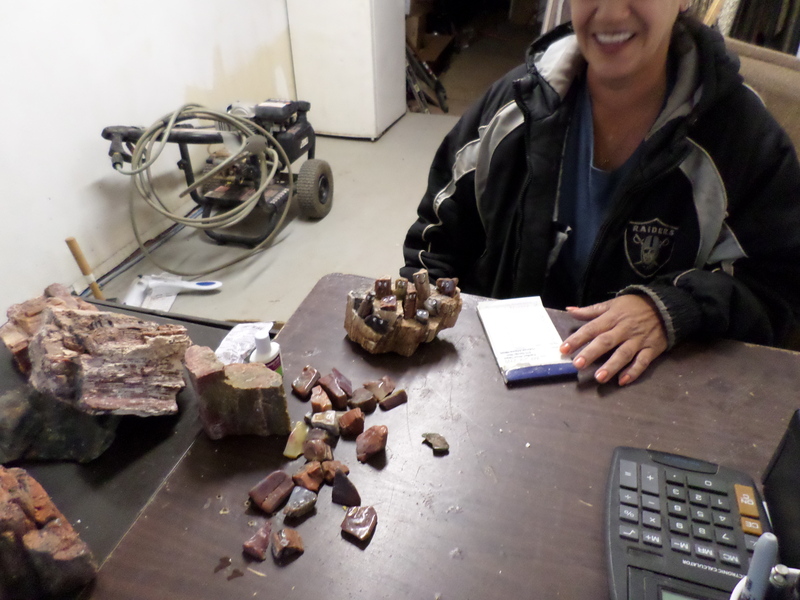 We immediately went out into downtown Holbrook to see if the petrified wood lying all over the place could be obtained at much lower prices than the gift shop in the park. Too right it can. The owner of this little place told us she watched the polishing being done, realised she could do it just as well and opened a few months ago undercutting everyone else in the place. I hope her business will last long enough for you to drop in because she is giving it away compared to others in town. No website or facebook page which is a shame because this must be the place to come. A genuine person working hard and charging realistic prices. She deserves to have social media likes. it’s called Petrified Wood Direct on Navajo Blvd, Holbrook. Looks like a shed from outside – google view here. 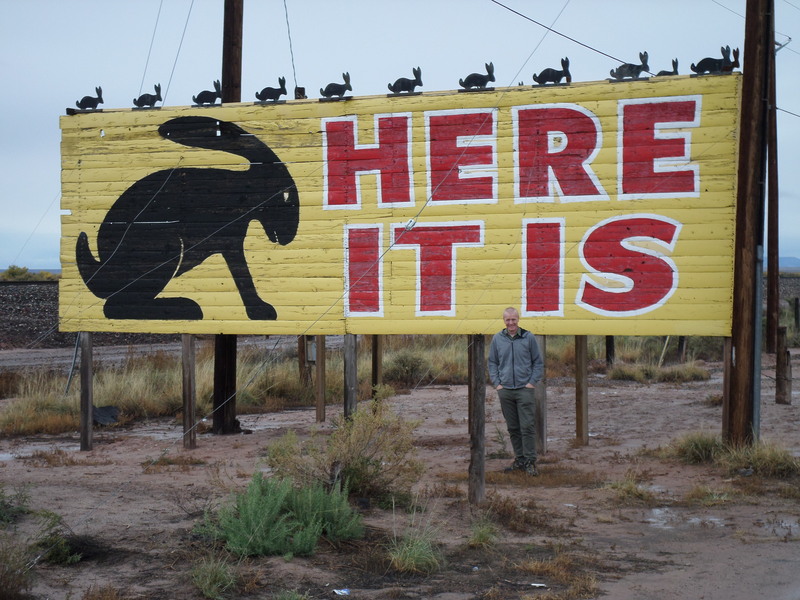 Our next stop was the Jackrabbit Trading Post and I finally got the picture I stole from the internet to start this blog off. The normally parched desert floor was thick with mud and my feet sank in a good few inches. The stuff was a nightmare to get off too. Lucky there were plenty puddles about. The car hire people will love me though. The Jackrabbit trading post is another place where they sell petrified wood at much cheaper prices than the gift shop at the end of the national park. It has a lot of other gifts there but they are struggling due to Route 66 popularity being on the downturn. They are thinking of closing for the winter for the first time in 66 years! Seems a shame that this journey is talked about so often but is not often enough taken. Now to the moment I prepared you for at the start. From the beginning of the trip we have been struck by how long the trains are. We passed this one on the left just after leaving Jackrabbit. The road is a bit rough so watch the bumps. Next up was the huge hole in the ground near Winslow caused by a meteor about 38, 000 years ago. It was $18 each to get to see it! The hole in my pocket made me so disturbed I barely noticed the flippin’ thing! I tried a panoramic picture to give you a better sense of the scale of it. It didn’t come out well but you get the idea. It’s good to see this large hole, no doubt about that, but it ain’t $18 worth of good to see. There is a sneaky way round if you are willing to risk your transport in the dirt track. We weren’t and took the hit. 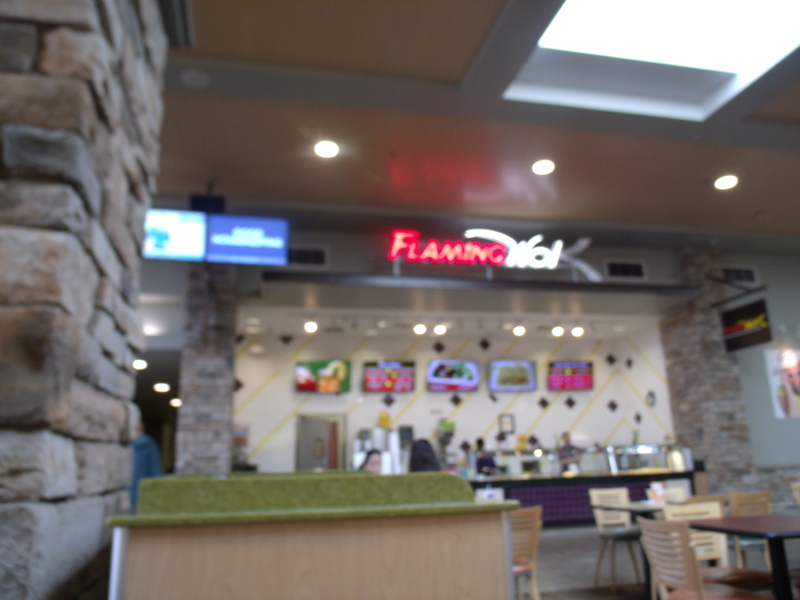 Into Flagstaff and their main shopping mall for lunch next up. 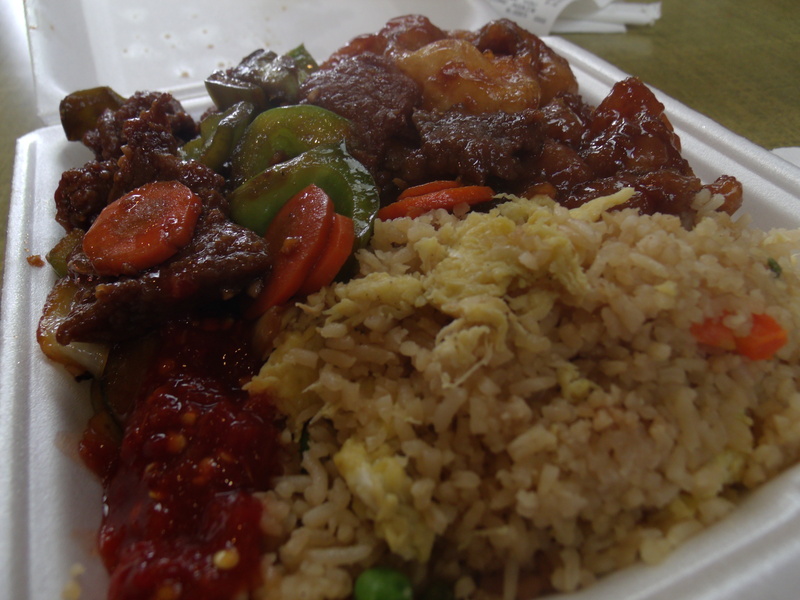 We decided on Chinese for a change and were delighted with the offerings at the Flaming Wok. Hefty portions and free testers to help you decide what you want. You pick rice or noodles and one, two or three entrees. We had two each and couldn’t finish it. $20 with a drink. It kind of spoiled our appetites for the rest of the day, and even after walking around Williams on arrival we could barely face the thought of dinner. The shops in Williams are well worth a visit. The section on Route 66 has more gift shops than we have seen in one place yet and the prices are very good. You could easily do all your gift shopping here. 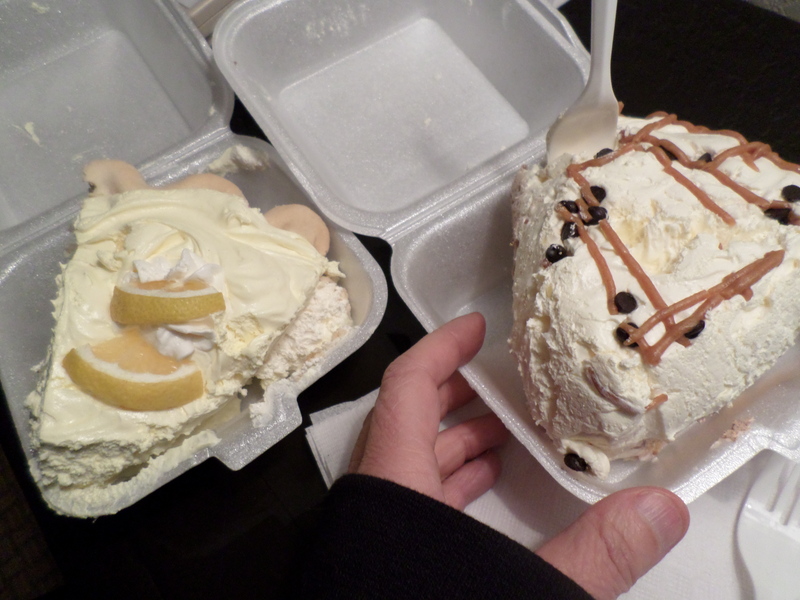 We couldn’t resist buying a ‘slice of pie’ at the Pine Country Restaurant (http://pinecountryrestaurant.com) but kept it until we got back to the motel and had recovered a bit. 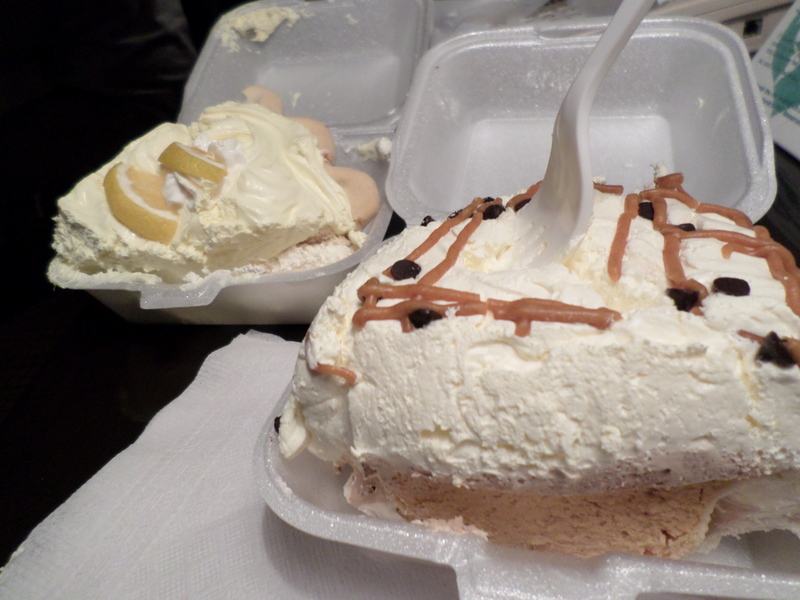 The motel provided a small dinner and we did partake of a small portion despite our lack of appetite. We were careful though and you can see why. We have these to eat. One is Lemon Cheese, the other is Banana and Peanut Butter. What is left over is going to fill in that damn meteor crater. What tasty slices of pie. Paying for the hole in the ground ? Don’t know about that. Pity about my wee daughter not sleeping well, I hope she doesn’t take it out on you or put her off her food.